The Prince of Wales Bay Marina boasts a 160 berth floating Poralu Marine pontoon system with state of the art marine facilities, catering for vessels up to 35 metres in length. The most significant benefit for boaties at Prince of Wales Bay Marina is the lower cost of berthing and maintenance, compared to mainland Australian berth and maintenance prices. 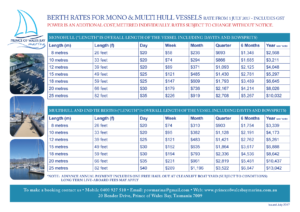 Click on Berthing Rates below to view larger, download or print. Click on Forms below to view, download or print.